A young man, haunted by his past, travels the land in search of the lyrics to a lullaby his mother used to sing to him. Makoto Sawai: Do you think one can live only for others? I wouldn't give many films a score of ten unless they were truly outstanding, not just better, but in a whole different league. It is a grade reserved for the likes of (if I may indulge in a little subjectivity) Tarkovsky's Stalker;, Kitano's Hana-Bi, In the Mood for Love' by Wong Kar-wai, Dreyer's Passion of Joan of Arc, Ozu's Tokyo Story; and very few others. It is more than mere technical brilliance, top-class acting, superb plot or camera-work. What each of these films possesses is sheer humanity, simultaneously painful and life-affirming. 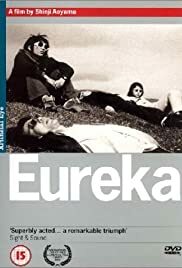 Eureka deserves to stand proudly in such company, for Eureka is a film that is so human it makes most others seem either shallow, over-wrought, or just pretentious. Eureka's plot is a simple, its action, dialog and soundtrack is sparse, camera movement is minimal. The sepia-toned photography is indeed a marvel to look at, and each of the actors performs with such restrained naturalness that they don't seem like performances at all. The result is a film that is less like a story being told, and more like an experience that is undergone or a journey shared. If there is any 'art' involved, it is in producing a film so fragile, yet so accessible, so desperately and painfully human out of material so grueling and alien to most of us fortunate viewers. And in this respect, the movement of Eureka mirrors that of the protagonists, the three traumatised survivors of a bloody bus high-jacking. They are a brother and sister,and the bus driver himself. In the wake of the tragedy, after some months of wandering and inactivity, they are drawn back together and set out on a bus. As may be gathered, this film is very much about the aftermath of tragedy, about how certain experiences may mark one off from the rest of society, and how with silence, stillness and human company, and most importantly, the passing of time, some form of healing may be glimpsed. And it is just a glimpse. Though the final scene is indeed moving, there is no big payoff, anymore than there might be in life itself. There is only the artistry of the film itself to transfigure the story, and it does this with such quiet, unobtrusive sympathy, that to call it 'artistry' seems almost to malign it. I haven't seen Aoyama's other films, so I can't say whether he is destined for a Tarkovsky-, Dreyer- or Ozu-like elevation to the cinematic pantheon, but this film is a refreshing example of the kind of deep humanity of the best directors, the best artists, one that marks a perfect 10 off from all the rest. 53 of 59 people found this review helpful. Was this review helpful to you?